President hails North Korean decision to allow nuclear inspections, dismantle nuclear test site. 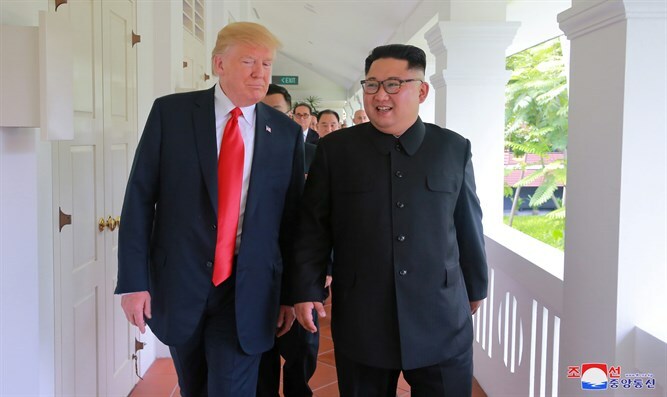 President Donald Trump lauded North Korea’s decision to permit inspections of its nuclear weapons sites, a crucial step towards implementing the June 12th meeting between President Trump and Kim Jong Un. The North Korean leader had agreed to de-nuclearization, though months after the signing of the agreement with the US, doubts remained whether the deal would result in real meaningful changes in the rogue state’s behavior. On Tuesday, South Korean President Moon Jae-in announced that North Korea had agreed to take steps towards dismantling its nuclear arsenal as part of a larger deal, in the framework laid out at the June meeting with President Trump. According to a report by the AP, during Moon’s visit to Pyongyang, the South Korean leader confirmed that Kim had agreed to dismantle a ballistic missile test site and a nuclear complex, adding that the leader had also agreed to inspections of nuclear sites. A day later, President Trump hailed the development, calling the decision “very exciting”. “Kim Jong Un has agreed to allow Nuclear inspections, subject to final negotiations, and to permanently dismantle a test site and launch pad in the presence of international experts,” Trump tweeted. The North Korean leader is expected to visit South Korea in the near future, Moon said, though no date for the visit has been announced.